A view of the outside of Trentwell Mason White Hall. 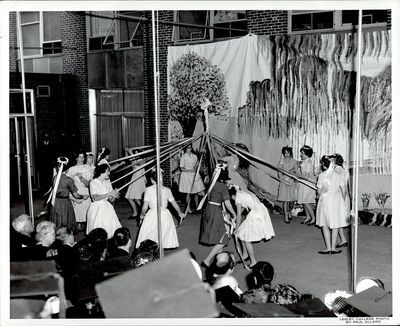 Fifteen students each hold a long ribbon extending from a May Pole. A crowd of graduates and other guests sit a few feet away from the pole.A painted backdrop of the countryside is behind them.